Happy as we are to welcome you to the site, we understand that, chances are, you’re here because you’ve either received faulty products or poor service, or both, from a major UK retailer – and that’s not good. The rise of the Internet has given companies new and exciting ways to offer terrible customer service. How many times have you been on hold and heard a message telling you that “all the information you need is on our website, why not hang up and go there?” And you just want to scream. If you’d wanted to go the website, you would have gone to the damn website and wouldn’t be on hold, being told how important your business clearly isn’t to the company in question. The main complaint we hear time and again from our users (and the reason for this site) is “it was so hard to find the phone number on their website”. It’s almost like the company doesn’t want you to call them! The reality is, answering calls is expensive. It takes lots of man (and woman) power to be able to answer calls within a sensible timeframe, especially during peak periods. How many times have you heard the truly excruciating “we are receiving unusually high call volumes at present so you’ll be on hold until the day you die, possibly longer”. But the odd thing is the message is always the same, whatever time you call, day or night. That would kind of lead you to believe that these are not ‘unusually high’ call volumes but ‘standard’, ‘regular’, ‘run-of-the-mill’ call volumes. And surely if these are ‘standard’ call volumes they should get some more staff? Why do some companies treat their customers so badly? Surely we are the people who pay the bills for these guys so why do companies treat us like this? For some it’s a question of survival – they simply can’t afford to pay people to answer the phones. For some it’s sheer greed, putting profits before customer satisfaction. For others it’s just routine incompetence. And, why is it that so many companies can afford to staff the sales lines but not the support ones? The main thing you must always remember is that, more often than not, you have a choice! If companies treat you like s**t, don’t give them any more of your money. And be sure to tell your friends. Social media has changed the world as far as terrible customer service goes, and the upheaval is only just getting started. You can make a difference! 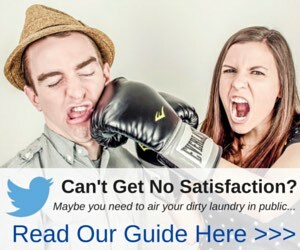 Check out our guide to complaining via Twitter here and stick it to the man socially. 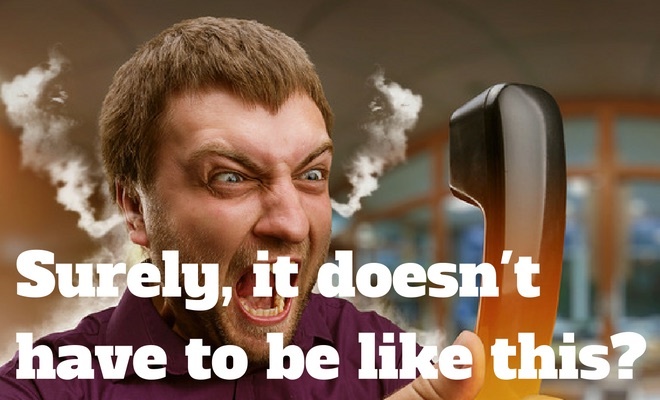 We understand that not all complaints are created equal – but we still want you to answer the damn phone! If you’ve been to a fast food restaurant and the tables were dirty, it’s a very different thing to having been sold a washing machine that threatens to burn your house down. Sometimes people just want to voice their opinion – often to help the business in question improve. It may sound bizarre, but many of us actually complain for the benefit of the business, as we want to see it buck its ideas up. We like what they do, but just want them to do it better! A complaint of that nature is very different to one where you’ve parted with your hard-earned money and been sold something that’s not fit for purpose, or, worse still dangerous! Every complaint is important, some just need different solutions to others. We can’t emphasise this point enough. These big companies may make you feel like you’ve lost the will to live but you are not powerless! They just make you think you are. You can find a detailed (and user-friendly) explanation of what this legislation means on the Which website here. It will come as no surprise to hear that very few companies will actually publish a dedicated ‘complaints’ number or list a specific department that handles complaints. The reason for this is fairly obvious – companies don’t want to openly admit that anyone would want to complain about their products or services. Why would they? It’s tantamount to admitting you’re rubbish and no-one is queuing for that accolade. Some forward-thinking companies tackle the issue head-on, but the vast majority make it pretty difficult to get through to anyone who’s happy to listen to your concerns. We can’t resolve your query for you, but we’ll do our very best to connect you to someone who can. 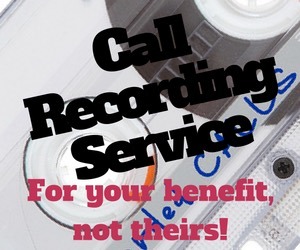 Optional call recording – puts YOU in charge! Well now, you can get your own back! Our calls are routed through a sophisticated IVR system which allows you, not them, to choose whether or not you want the call to be recorded. If you choose to do so, you’ll be given a call ID which you can, after your call, enter on our website to request the audio file recording of the call. We will then send this to you via email within 24 hours. No more “we never said that’” type answers. You’ll be amazed how much more seriously people take you when they know that there’s a record of what’s being said, that can come back to haunt them. And, just for your information, you are under no obligation to inform the person on the other end of the phone that you are recording the call. 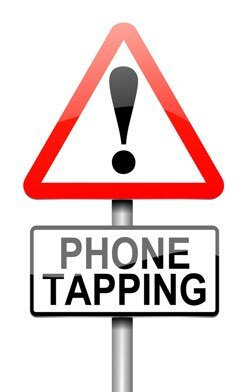 Big companies have an obligation to inform you if they are recording the call, but you, as an individual, have no obligation to inform them. So you can decide if, and when, to play your ace. We hope that your query will be resolved the first time you call, but sadly we know this isn’t always the case. We see lots of comments from people saying they’ve had to call multiple times to get a satisfactory resolution of their problem. To save you the headache of hunting for the number again we’ll send you a text message free-of-charge so you’ll have a record of the number if you should need it again in the future. Where possible, in addition to a phone number, we also list email and social media contact details so you can contact the company every way you can for maximum results. As a general rule, email is the way they want you to get in touch, as they can answer in their own sweet time, with a template reply that is as much use a chocolate teapot. But having said that, sometimes it does the job. Social media on the other hand can have dramatic effects. A company’s Twitter or Facebook page can be just the place for you to vent your anger, as that is exactly the opposite of what they want to see plastered across a public forum. Make a nuisance of yourself and you’ll be amazed at the results you can achieve. We explain more in our guide here. Sometimes you just want to get it off your chest – and we totally understand that. And what’s more we encourage it! Search for the company who have let you down on our site and add your comments to their listing page. It probably won’t get their attention (but it might). More importantly, other users will read your comments and share their experiences, and may even be able to help you to find a resolution. At the very least you’ll get a cathartic effect from writing it down and you may save other buyers from experiencing the same problems. We like to be very honest and upfront. Most of the numbers on our site are of the format 0844 ……. These number incur a charge of 7p per minute and we receive a percentage of this charge back from the network operators. We do this to pay the running costs of the site and to pay for the services listed above which cost us money i.e. call recording, sending sms messages etc. If we’re lucky we also make a little profit which rewards our time and effort for researching phone numbers, replying to messages and helping out where we can. Most of the numbers on our site will be available somewhere on the web if you hunt around and, if you’ve got the time, we recommend you do so. If you just want to cut to chase, use one of our listed numbers to get your complaint resolved fast – so you can move on with your life. We wish you the best of luck getting your complaint resolved and please feel free to get in touch if you need help.